Welcome to the easiest family devotional you’ll ever come across- Marshmallow Madness! …and all you need is a bag of marshmallows. 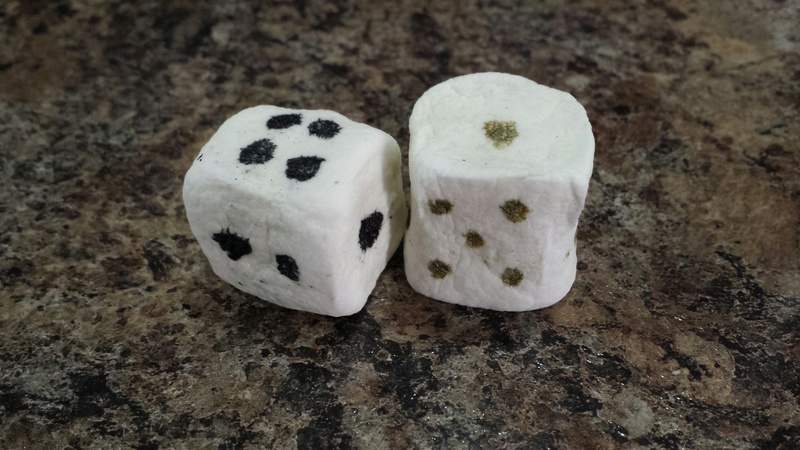 Take some large marshmallows and encourage the kids shape them into dice. Once the die is formed, mark it with dots from 1 – 6 with a permanent marker. (These will not be edible) It will harden in that shape. Practice throwing them to see if they really are equal sided. Probably not, but don’t worry, its all for fun! Explain what “casting the lot” actually means. It is the fairest way to make a decision when there isn’t a clear answer. It isn’t gambling, because there isn’t a hope for gain and a fear of loss. When each outcome has the same chance there isn’t a win and a loss, it’s one way to choose between two equally right options. In ancient times they used colored rocks and sticks mainly, now we tend to use dice or flip a coin. Some families use “pick a number between 1 and 10” and the closest to the predetermined secret number decides the outcome, and others use “rock, paper, scissors” or other games of chance. Imagine 2 teams playing soccer together. The Big Blue Team is older and has been practicing for 2 extra years. They are better skilled then Young Yellow Team and within a few minutes the Big Blue’s have scored 3 goals on the Young Yellow’s. The Young Yellow Team complains It’s Not Fair! because Big Blue is bigger kids that they could never beat. The parents discuss switching some of the Blue Team players with the Young Yellow’s to make both teams more evenly matched. The Big Blues argue that Its Not Fair! to break up their team just because they been practicing extra hard. They deserve to win. What should the parents do? Which answer is more fair? Whatever the children decide, they’re right! Both solutions are right and both fair, depending on who’s perspective you’re thinking about. If you’re on Young Yellow Team you’d think the match-up wasn’t very fair to begin with. If you’re a part of the Big Blue Team, you might think you’re entitled to beat them fair and square. Aren’t family members sometimes “strong opponents”? Does it ever feel unfair? Role play a problem kids are coming up with and pretend to roll the dice to decide the outcome. Is this a good method to solve problems? When would it be a good idea to cast the lot? Look up Proverbs 18:18 in your Bibles, and pray for wisdom to know how to settle disputes, especially with strong opponents! Finish off with a quick family prayer. God cares about every area of our lives; let’s encourage the children to pray about whatever is on their hearts. Add to your prayer journal weekly, and be sure to leave space to jot down a quick note when God answers the prayer. Your kids will grow stronger in their faith when they can look back and see what the Lord has done.How did this work for you? Did you adapt it to fit your family?